Passion flower is a woody, hairy, climbing vine; the stems, from 10-30 feet long, climb by means of axillary tendrils. The alternate, serrate leaves are palmately 3 to 5 lobed. 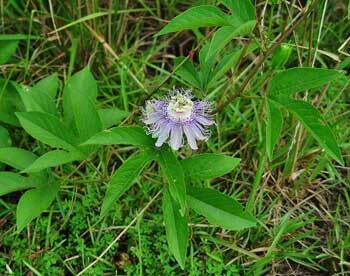 Solitary, axillary, white flowers with purple, blue, or pink calyx crown bloom from May to July. The fruit is an edible, many-seeded berry (maypop) almost as large as a chicken egg. Grows wild in the southern United States, from Virginia and Florida westward to Missouri and Texas. Also cultivated in cooler climates; grows best in partial shade in rich, moist, well-drained soil. Native of Southern United States and the West Indies. There are more than 400 different species growing in North America and Mexico. Many of them have fruits with juicy pulp, which are eaten as fruit and yield a delicious juice that is called passion juice. The priests who accompanied the conquistadors to the New World in the 16th century considered the discovery of this beautiful flowering vine in South America to be a propitious, God-given sign that Christianity would be well received in the new land. 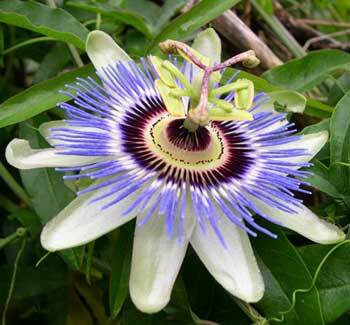 Passion flower got the name from supposed resemblance of parts of the flowers to Jesus’ wounds, crown of thorns, etc. They gave the plant its name, by a Jesuit priest, Padre Ferrari, because the various parts of the flower appeared to them to be symbolic of Christ’s passion: the 10 petals represent the faithful apostles, excluding the traitor Judas and also Peter for his denial; the corolla symbolizes the crown of thorns; the 5 stamens stand for the 5 wounds; the ovary suggests the hammer with which Christ was nailed to the cross; and the styles with their rounded heads provide the nails. Because the natives relished the yellow fruit of the plant, the priests were encouraged in their mission, interpreting the eating of the fruit as symbolic of the Indians’ hunger for Christianity. Padre Ferrari served as a missionary to Mexico. The vines of the passion flower often climb to the highest treetops and sends out an abundance of radiant white and purple flowers. Tincture: take 15 to 60 drops in water, as needed. For restlessness in children, give 3 to 10 drops in water every 30 minutes until results are obtained. For insomnia: Tincture of Skullcap, 1 oz. and Tincture of Passion flower, 1 oz. Dose: 20-60 drops in water as required. Potentially harmful in large amounts. May cause drowsiness in some people, care should be taken in driving or operating machinery.